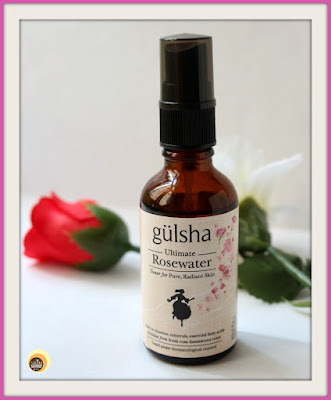 Gulsha Ultimate Rosewater is produced drop by drop by the gentle steam distillation of fresh rose petals in pure copper alembics, is more than a rosewater. Usually, rosewater is a by-product of rose essential oil distillation. By keeping the valuable rose essential oil, Gulsha has created the Ultimate Rosewater which contains all the vitamins, minerals, and essential fatty acids of the precious rosa Damascena flower. Use to cleanse, tone and nourish your skin in a single step. Just spray your face, neck and body as needed to refresh, balance and soothe your skin throughout the day. For external use only. From natural rosa damascene flower water. Keep away from direct sunlight. 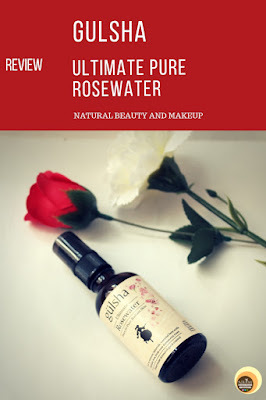 I have been using this rose water for a long time and had published my first impression on this on my Instagram page as well! When my skin wasn’t behaving well a few months back, this was the only toner I used to calm down all my skin woes. Also, I shall be reviewing all those skin care products that helped immensely in treating my skin problems on NBAM. Hope you find these posts helpful. 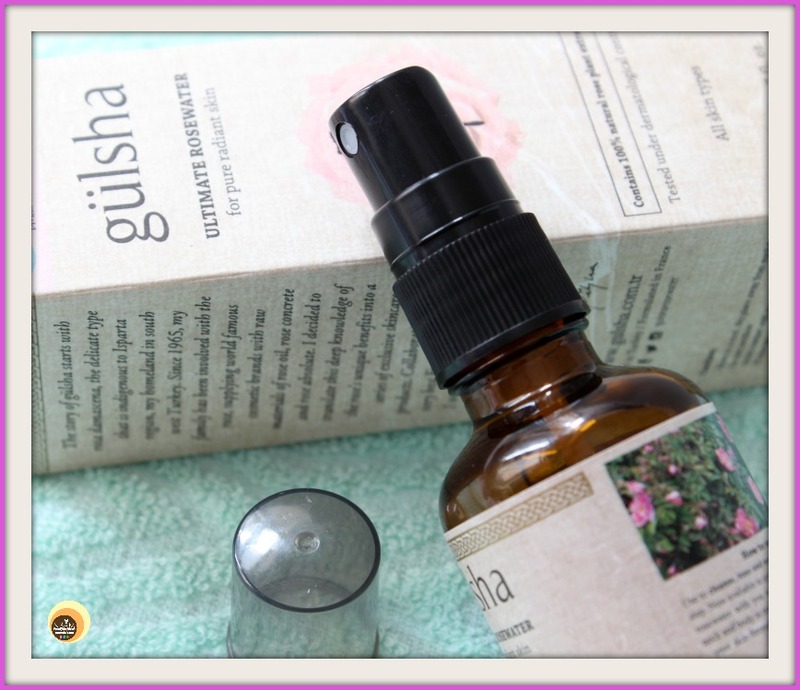 Gulsha Ultimate Rose Water comes in a 50ml sized, small, dark brown, and translucent glass bottle. It has a spray mechanism and is further fitted with a sturdy cap to avoid leakage. All necessary information regarding this rose water is labelled on the packaging itself. Overall, the packaging is travel-friendly and is easy to use! 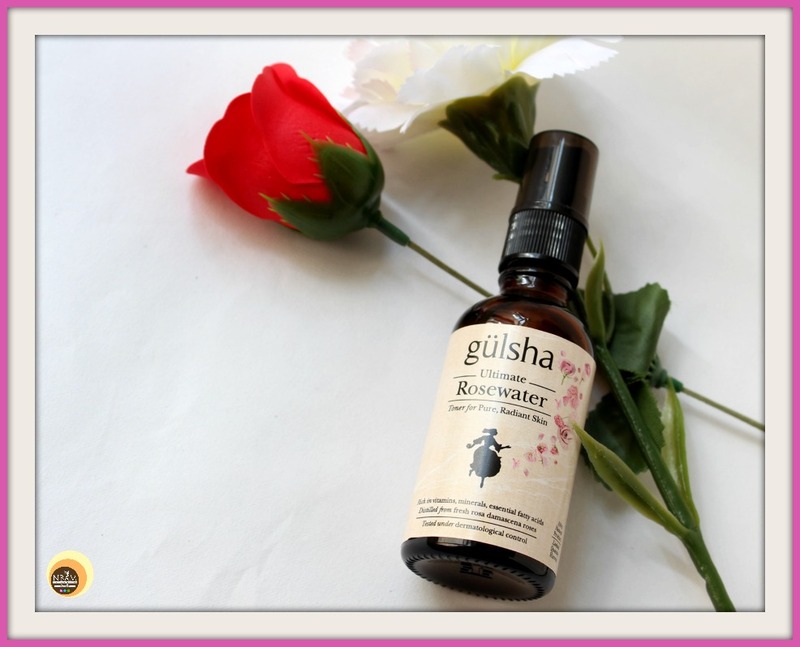 Gulsha rose water is liquid in nature and has a strong herbal rose scent to it. I have used this rosewater in summers as well as in winters and in every season it has shown its awesomeness. FYI, I am on my 3rd bottle at present. Upon application, it does remove the residual dirt or grime left behind by the face wash while hydrating the skin, all in a single step. All you need to do is – SPRAY ON!! 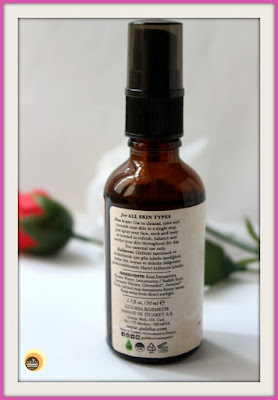 It sprays a fine mist evenly to the skin. The toner makes the skin so soft, refreshed and nourished. It also helps minimize the appearance of large pores, therefore, makes your skin look healthy, plump and bright. Since Gulsha Rose water is pretty moisturizing, oily skinned beauties may find it a tad heavy on their skin during hot, humid months. This rosewater alone is sufficient to hydrate my skin during the daytime in summers (it’s that nourishing!). Also, I tried the Korean 7-skin method of using toner multiple times (at least 7 & above) to achieve maximum hydration, during that bad acne phase. Ah! 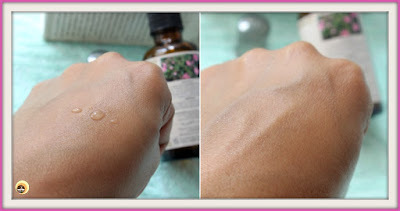 Even in that case too, it worked incredibly well on my combination, sensitive skin. I didn’t feel to use any moisturizer afterwards! 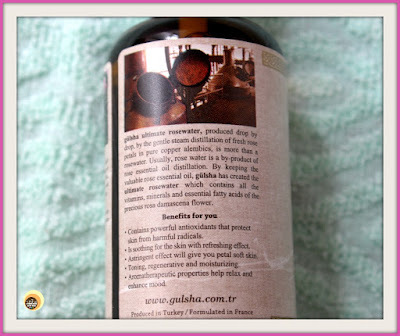 Gulsha rose water has Leuconostoc/Radish Root Ferment Filtrate as an ingredient aside from rosa damascene flower water. It’s nothing but an alternative to harmful preservatives like Phenoxyethanol/parabens. A preservative created by fermenting Raphanus sativus (radish) roots with the microorganism, Leuconostoc, bacteria from lactic acid. (*source). As Gulsha Ultimate Rose Water is quite expensive, I never mix this with any of my DIY facemasks (for that I use Gulabari rosewater). The spray mechanism makes it a super user-friendly. I can take it or apply it anywhere, everywhere, whenever my skin screams for some hydration boost! When applied, provides a refreshing effect! I love its mood enhancing rose fragrance! It makes skin firm and tighter! The sprayer is good, sprays an even & uniform fine mist to skin! Pretty expensive for the quantity it comes! The strong fragrance might be bothersome to people with the sensitive nose! Availability is an issue! You can order it from Amazon site though! Gulsha Ultimate Rose Water is a great skin toner packed with powerful antioxidants that truly nourishes your skin apart from cleansing and toning. The first time I used this rose water, I was completely gobsmacked by it. In short, I love its moisturizing formula that tones, firms & soothes the skin and makes skin look youthful. Hope you found the review helpful! 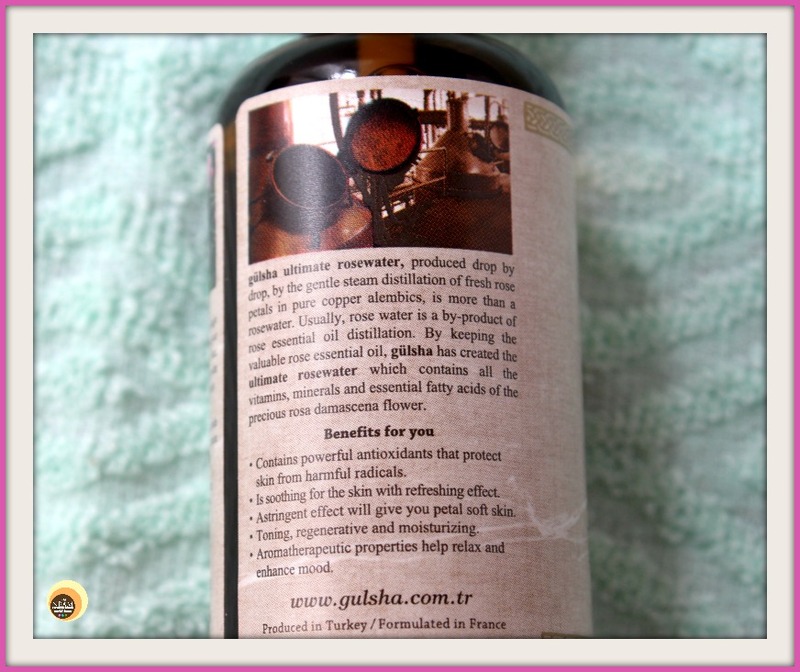 Have You Ever Tried Gulsha Ultimate Rose Water? If Yes, Please Share Your Experience With Me In The Comment Section Below. You have reviewed it earlier also, right? I love rosewater! It's one of the few things that quickly calm my skin down. I don't mind the scent at all. I find it nice and refreshing. Same here, Lisa <3 Thank you! i really love my kama rose water ..this one also seems a good option, i'll check this at amazo..
Oh, I love that too :)thank you! Thank you fro this natural rosewater. 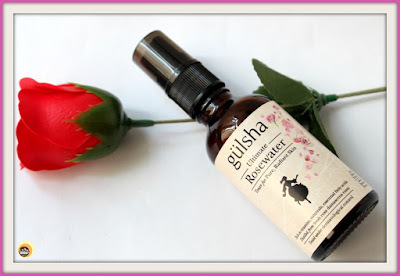 I really love rosewater, I am out so I may try this brand the next time I do an Amazon order! I use rose water based toners on my face and I love the smell. Sounds like a great product. I’ve heard so many good things about rosewater lately but haven’t tried it out. Mostly because of the price, but it sounds like it may be worth it. I have never tried a rosewater toner before, but this one sounds like a great product to try. Such great benefits! Sounds like it's a great product. I have heard that Rosewater is helpful for the skin and my daughter is always seeking out good skincare products. I will show this to her. I have heard so many amazing things about rose water. I have always wanted to give it a try and see what it can do for my skin.